Corporations Don't Want to Report Their True Earnings. Why is The Financial Press So Eager to Help? I totally understand why corporations may wish to push the envelope on earnings adjustments to make their stock look like a better buy. But why is the financial media generally complicit with this? 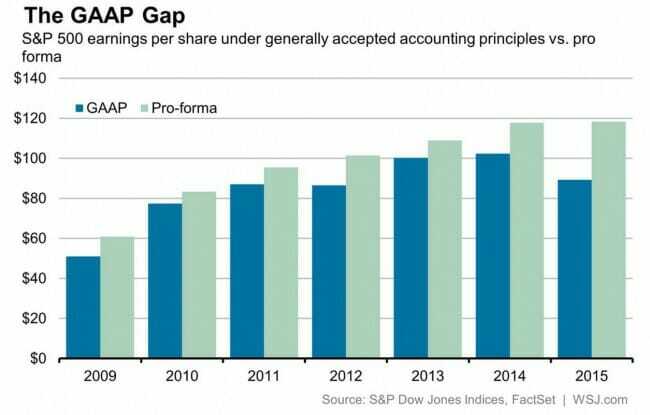 Take any earnings announcement you read about or hear on the TV -- almost every single time it turns out that the earnings number quoted by the press, at least in the headline or the TV sound bite, is the company's non-GAAP adjusted number, not their actual GAAP number. I might be OK with this if this were being done for good reasons, ie if the financial press thought the adjusted number was somehow more representative. But I don't get this sense at all. It feels more like the press is just lazy and accepts whatever number is in the press release without digging further. Often in a longer story you will find the GAAP number, but buried many grafs in. A good way to think about this chart is that, if you are not careful, you are paying for the bar on the right but getting the bar on the left. Note that without adjustments, earnings fell pretty substantially in 2015. It is not at all clear to me why we have not seen this story.